Roy’s Restaurant Hawaii Food & Wine Festival Sweepstakes – Win a trip to Hawaii! Win a trip to Oahu, Hawaii & more! ENTER SWEEPSTAKES HERE – Roy’s Restaurant Sweepstakes page. ENTRY LIMIT – Regardless of the method of entry (online or mail-in) you may only enter one (1) time during the Sweepstakes Period. ELIGIBILITY – The Sweepstakes is only open to legal residents of the fifty (50) United States (excluding Rhode Island, Alaska, Hawaii and the District of Columbia) who are twenty-one (21) years of age or older at the time of entry. SWEEPSTAKES PERIOD – The Roy’s Restaurant Hawaii Food & Wine Festival Sweepstakes begins at 9:00 a.m. Pacific Standard Time (“PST”) on June 24, 2015 and ends at midnight PST on August 15, 2015. PRIZES – GRAND PRIZE AND CONDITIONS: One (1) Grand Prize will be awarded to the Grand Prize Winner. The Grand Prize package includes: (a) Round-trip coach-class air transportation for the Grand Prize Winner and one (1) guest from a major airport in the continental U.S. near Grand Prize Winner’s residence (determined by Sponsor at its sole discretion) to an airport servicing Oahu, Hawaii. Transportation to and from major airport is not included and is the sole responsibility of the Grand Prize Winner and Travel Companion. Trip must be taken on September 9 through September 13, 2015. If in the judgment of Sponsor air travel is not required due to Grand Prize Winner’s proximity to prize location, ground transportation will be substituted for round-trip air transportation at Sponsor’s sole discretion; (b) four (4) nights hotel accommodations, double occupancy at the hotel of Sponsor’s choice; (c) a five hundred dollar ($500.00) American Express® Gift Card for all meals, transportation and incidentals during travel and stay or for use at Grand Prize Winner’s sole choosing; (d) two (2) tickets to the Festival Signature Event (9/10/15) at The Modern Honolulu; (e) two (2) tickets for the Festival Signature Event (9/12/15) at the Hawaii Convention Center; (f) a private meet-and-greet with founder Roy Yamaguchi and; (g) dinner at Roy’s Restaurant on 9/11/15. The total approximate retail value (the “ARV”) of the Grand Prize is $5,000. 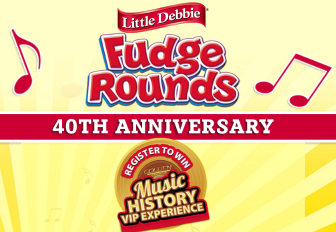 Little Debbie Fudge Rounds 40th Anniversary Giveaway Sweepstakes – Win a trip to Los Angeles & more! Win Grammy Museum VIP Package and a trip to Los Angeles for two! ENTRY LIMIT – There is a limit of one (1) entry per person per day. ELIGIBILITY – The Giveaway is open to all legal residents of the United States (excluding Hawaii and Alaska) and the District of Columbia who are at least 18 years or older at the time of entry. SWEEPSTAKES PERIOD – The Giveaway begins on Monday, June 1, 2015, at 12:00 AM Eastern Time (“ET”) and ends on Monday, November 30, 2015, at 11:59 PM ET. PRIZES – Grand Prize : The Grand Prize Winner will receive a Grammy Museum VIP Package and a trip to Los Angeles for two (2). The Grand Prize includes round-trip coach class airfare for two (2) from an airport within the 48 contiguous United States reasonably close to the Grand Prize Winner’s city of residence to Los Angeles. All travel arrangements will be made by Winspire Sports and Entertainment as a designee of Sponsor, whose decisions regarding the itinerary are final. Selection of airline and airport shall be at the discretion of Sponsor or its designee. Airfare is subject to availability. Airfare must be booked by January 1, 2017 . The Grand Prize also includes a three (3) night stay in one (1) standard Fairmont room at the Fairmont Miramar Hotel, Santa Monica, daily breakfast for two (2) at the Fairmont Miramar Hotel during the Grand Prize Winner’s stay (up to a maximum of $25 per person, per day), two (2) entry tickets to the Grammy Museum in Los Angeles, CA, a private custom behindthescenes tour for two (2) to the Grammy Museum and one (1) $150 American Express gift card towards dining at L.A. Live in Los Angeles. All hotel and airfare taxes are included. The Grand Prize Winner will also have access to Winspire’s booking and concierge service for add on travel and trip arrangements at his or her own expense. All other expenses not specified above including, but not limited to, baggage fees, ground transportation, meals, beverages, gratuities, incidentals, and taxes are the sole responsibility of Grand Prize Winner. The Grand Prize must be booked a minimum of sixty (60) days in advance. Certificates and gift cards cannot be replaced if lost, stolen or destroyed. The estimated retail value of the Grand Prize is $5,500.00. Monthly Prizes : Each of the six (6) Monthly Prize Winners will receive a case of LITTLE DEBBIE Fudge Rounds (the “Monthly Prize”). The estimated retail value of each Month Prize is $28.64. Little Debbie® Sail Away Summer Giveaway Sweepstakes – Win a cruise to the Bahamas! Win a Carnival cruise to the Bahamas & more! ENTRY LIMIT – Maximum one (1) entry per person per day during the Giveaway Period. ELIGIBILITY – The Giveaway is open to all legal residents of the fifty (50) United States and the District of Columbia who are eighteen (18) years old or older (nineteen (19) years old or older for Alabama and Nebraska residents) at the time of entry. The Giveaway is also open to all legal residents of Canada (excluding the province of Quebec) who are the age of majority in their province/territory. SWEEPSTAKES PERIOD – The Giveaway begins on Monday, June 1, 2015, at 11:59 AM Eastern Time (“ET”) and ends on Monday, August 10, 2015, at 11:59 AM ET. PRIZES – One (1) Grand Prize: Grand Prize Winner will receive a Four (4) Day Carnival Cruise to the Bahamas for four (4) people. Prize Package includes; a four (4) day Carnival cruise to the Bahamas (one room/cabin, quad occupancy); coach airfare for four (4) people from a Sponsor-specified city of departure (to be determined based on where the Grand Prize Winner resides at Sponsor’s sole discretion) to Miami, Florida; four (4) tickets to the Swim with the Dolphins excursion in Freeport, Bahamas (must be twelve (12) years of age or older to participate in this excursion); $500.00 in spending money (may be awarded in the form of a Visa gift card); and a Little Debbie® product prize pack. Approximate Retail Value: $3,530.00. Ten (10) Weekly First Prizes (one (1) awarded per Weekly Entry Period): Each Weekly Winner will receive one (1) Ultimate Beach Kit. Ultimate Beach Kit consists of the following: one (1) umbrella, one (1) Wagon, one (1) set of Backpack Chairs, one (1) Towel, one (1) Sunscreen Product and one (1) fifteen (15)-piece Beach Sand Toy Set. In addition, the Weekly First Prize winners will receive one (1) Little Debbie® Products Prize Pack (consisting of a selection of Little Debbie® snack food products). Approximate Retail Value: U.S.$412 per prize. Ten (10) Weekly Runner-Up Prizes (one (1) awarded per Weekly Entry Period): Little Debbie® Products Prize Pack. Approximate Retail Value of each Weekly Runner-Up Prize: U.S.$10 per prize. 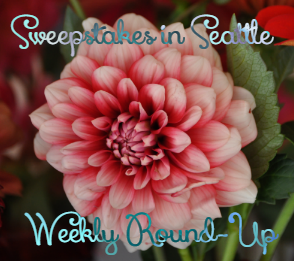 Sweepstakes in Seattle Weekly Round-Up 6/28 – Win a trip to Hawaii,a Weber Grill, gift cards & more! Well, there wasn’t a weekly round-up last week. Sickness visited my home – both for me and my husband and I spent a lot of time at the doctor’s office with my hubby and even the ER, but all is going much better this week – thankfully! I’m trying to get caught with the sweepstakes while still dealing with some recovery – so be patient with me. I love sweepstakes, but there are other things more important and family is at the top of my list of what’s most important! Hope you’re surviving this heat wave we’re having. I’m ready to just hang out in the pool to keep cool! Remember, Sundays I will only post the weekly round-up so you can get caught up and see if you missed any of the sweepstakes posted during the past week. Have a great Sunday and check back tomorrow for new sweepstakes! I’ll also share winner’s stories here, so if you win a prize, let me know and you can be a part of the weekly round up! Scott won a song download from the Twix IWG! DeAnn won a song download from the Mars Chocolate IWG! 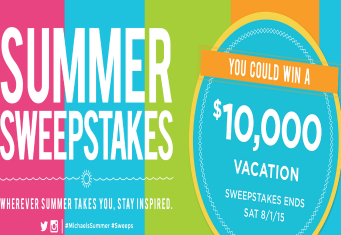 Michaels Summer Sweepstakes – Win a $10,000 Visa gift card! Win a $10,000 Visa gift card! ENTER SWEEPSTAKES HERE – Michaels Sweepstakes page. ENTRY LIMIT – Only one (1) Entry per individual during the Sweepstakes Period is allowed; multiple entries using different email addresses for a single individual will be disqualified. ELIGIBILITY – The Michaels Summer Sweepstakes is open only to legal residents of the 49 continental United States (excluding Hawaii), Washington, DC and Canada (excluding the Province of Quebec) who are at least eighteen (18) years of age as of June 14, 2015. SWEEPSTAKES PERIOD – The Sweepstakes begins at 12:00:00 a.m. Central Daylight Saving Time (“CDT”) on June 14, 2015 and ends at 11:59:59 p.m. CDT on August 1, 2015. PRIZES – The Grand Prize Winner will receive a Grand Prize consisting of a $10,000 USD Visa Gift Card (the “Grand Prize”). 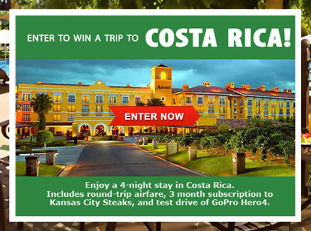 Win a trip to Costa Rica & more! ENTER SWEEPSTAKES HERE – Kansas City Steaks Sweepstakes page. ENTRY LIMIT – Limit one (1) entry per person during the Sweepstakes Period, regardless of method of entry. ELIGIBILITY – The Win a Trip to Costa Rica Sweepstakes Official Rules is open only to legal residents of the fifty (50) United States and the District of Columbia (excluding residents of Puerto Rico, and all other U.S. territories and possessions) who are at least twenty-one (21) years old at the time of entry. SWEEPSTAKES PERIOD – The Sweepstakes begins on June 13, 2015 at 12:00 a.m. Eastern Time (“E.T.”) and ends on July 22, 2015 at 11:59 p.m. E.T. Total Approximate Retail Value (“ARV”) of Prize: $3,500. Pirelli Ultimate Roadtrip Sweepstakes – Win a trip to Palm Springs & more! Win a trip to Palm Springs, $500 spending money, a GoPro Hero 4 and more! ENTER SWEEPSTAKES HERE – Pirelli Sweepstakes page. ENTRY LIMIT – Limit one (1) initial Giveaway Entry and three (3) Bonus Giveaway Entries for a total of four (4) Giveaway Entries per person during each Giveaway Entry Period. ELIGIBILITY – The Pirelli Ultimate Roadtrip Sweepstakes & P Zero™ All Season Plus (PZAS+) Giveaway is open to legal residents of the fifty (50) United States and the District of Columbia who are eighteen (18) years of age or older and licensed drivers possessing valid driver’s license at the time of entry. SWEEPSTAKES PERIOD – The Promotion will begin on or about May 27, 2015 at 12:00 PM Pacific Time (“PT”) and end on or about July 28, 2015 at 12:00 PM PT. PRIZES – Three (3) PZAS+ Giveaway Prizes: Each PZAS+ Giveaway Prize consists of a set of four (4) Pirelli P Zero™ All Season Plus tires. The ARV of each PZAS+ Giveaway Prize: $500. One (1) Ultimate Roadtrip Sweepstakes Grand Prize (hereafter “Grand Prize”): The Grand Prize consists of a trip for Grand Prize Winner and one (1) Guest to Palm Springs, CA. (hereafter “Grand Prize Trip”.) Grand Prize Trip includes of round-trip economy class air transportation for Winner and Guest between major commercial airport nearest winner’s permanent residence and Palm Springs, CA, three (3) day rental of a Cadillac ATS (or similar) from Sponsor-designated rental company, three (3) night hotel accommodations (one standard room, double occupancy) at the Saguaro Hotel in Palm Springs, CA, one (1) GoPro Hero 4 Silver with suction mount and $500 spending money. The ARV of the Grand Prize: $3,450. 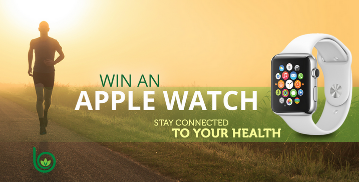 The Best Life Sweepstakes – Win an Apple Watch! ENTER SWEEPSTAKES HERE – Best Life Sweepstakes page. ENTRY LIMIT – Entry is limited to one (1) submission per entrant per day. ELIGIBILITY – The Best LifeTM Promotion is open to all legal residents of the U.S. who are at least eighteen (18) years of age as of June 1, 2015. SWEEPSTAKES PERIOD – The Promotion will begin at 8:00 am Pacific Time (“PT”) on June 1, 2015 and end at 10:00 pm PT on June 30, 2015. PRIZES – :Each winner of the Standard Prize will receive one (1) Apple Watch Sport and in the amount of $349.99. The total ARV of the Standard Prize of $349.00. Tetley® Tea “Daily Chill” Sweepstakes – Win Tetley Tea and a 3-gallon beverage dispenser! Win 4 boxes of Tetley Tea and a 3-Gallon Beverage dispenser (30 winners)! ENTER SWEEPSTAKES HERE – Tetley Tea Facebook page. ELIGIBILITY – The Sweepstakes is open to legal residents of the fifty (50) United States and the District of Columbia who are at least eighteen (18) years of age and older. 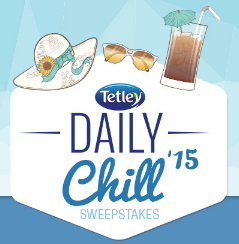 SWEEPSTAKES PERIOD – The Tetley® Tea “Daily Chill” Sweepstakes begins at 12:01 AM Eastern Time (“ET”) on June 10, 2015 and ends at 11:59 PM ET on August 19, 2015. PRIZES – Up to thirty (30) total prizes will be awarded. Each prizewinner will receive four boxes of Tetley Iced Tea Blend and one 3-Gallon Beverage dispenser. The approximate retail value (“ARV”) of each prize is $57.53. Mars Chocolate 2015 Road Trip Instant Win Game – Win a $10 Restaurant eGift cash! Win a $10 Restaurant eGift Cash or other great instant-in prizes! ENTER SWEEPSTAKES HERE – Mars Chocolate Sweepstakes page. ENTRY LIMIT – LIMIT: ONE (1) TEXT MESSAGE PLAY OR WEBSITE PLAY PER EMAIL ADDRESS PER CALENDAR DAY. ELIGIBILITY – This Road Trip Game is open to individual legal residents of the 50 United States and Washington, District of Columbia who are age 13 or older as of date of participation. SWEEPSTAKES PERIOD – Sweepstakes begins at Noon ET on June 15, 2015 and ends at 11:59:59 am ET on August 10, 2015. PRIZES – Nine Thousand Five Hundred (9,500) First Prizes: each, a $10 Restaurant eGift Cash valid for $10 off at participating restaurants (awarded as a code redeemable at http://www.erestaurantcash.com/roadtrip and subject to terms and conditions available at http://www.erestaurantcash.com/terms); Approximate Retail Value (“ARV”): $10.00 each. Ten Thousand (10,000) Second Prizes: each, a $5 Pre-Paid Debit Card; ARV: $5.00 each. Twenty Four Thousand Five Hundred (24,500) Third Prizes: each, a $5 Restaurant eGift Cash valid for $5 off at participating restaurants (awarded as a code redeemable at http://www.erestaurantcash.com/roadtrip and subject to terms and conditions available at http://www.erestaurantcash.com/terms); ARV: $5.00 each. Brand, M&M’S® Brand, TWIX® Brand, STARBURST® Brand or DOVE® Chocolate Ice Cream product; ARV: $2.49 each. One Hundred and Twenty Five Thousand (125,000) Fifth Prizes: each, a coupon redeemable for one package (6.0-6.3oz.) of a COMBOS® Snacks product; ARV: $2.89 each. Fifty Thousand (50,000) Sixth Prizes: each, a coupon redeemable for one bottle (20 oz.) of a Dr Pepper® product; ARV: $1.89 each. 3 MUSKETEERS® Brand or MILKY WAY® Brand product; ARV: $1.49 each.